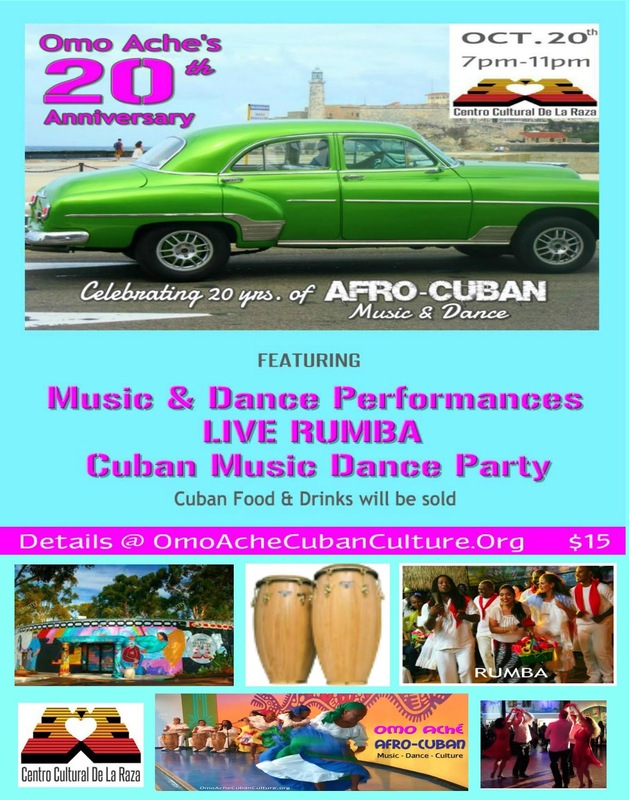 WHAT: Omo Aché celebrates 20 years of AFRO-CUBAN culture here in San Diego! What better way to commemorate our mission to preserve & perform this heritage than sharing it with you! as well as former company members & Special Guests as they showcase Afro-Cuban Folklore from Orisha, Congo & Franco-Haitian traditions! & Ruedas de Casino when we jam to the best Cuban dance music! 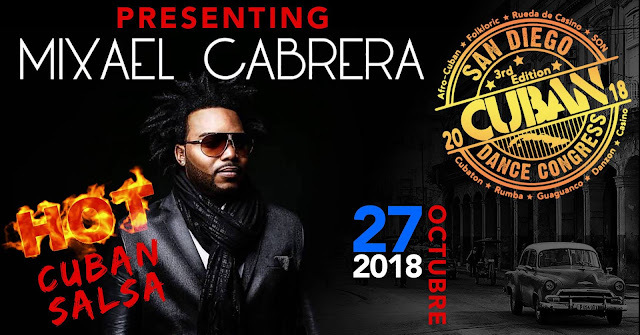 in concert at the 2018 SD Cuban Dance Congress! *Cuban Food & Drinks will be available for purchase. CURUYE's ANNIVERSARY CUBAN SALSA TIMBA DANCE PARTY! PA' GOZAR Y CELEBRAR! COME DANCE & CELEBRATE CURUYE’s DOUBLE ANNIVERSARY CUBAN DANCE PARTY- 15 YEARS of CURUYE.COM, and 9 YEARS of CUBAN DANCE PARTIES in L.A.! SITARA SON led by Master LÁZARO GALARRAGA will lead a set of LIVE MUSIC at 7:15 PM. DEEJAY WARAPO will be keeping the energy up with the latest and hottest CUBAN DANCE MUSIC! An evening of CUBAN SALSA! SON! TIMBA! REGGAETÓN! RUMBA! RUEDAS! RAFFLES! GIFTS! CELEBRATION! 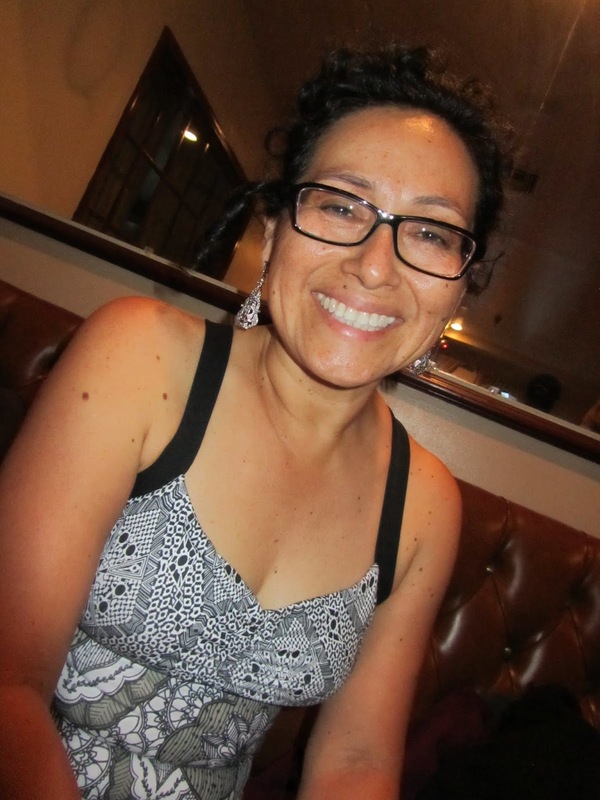 MARTIZA BAÍDA will be back by popular demand to teach a 5:30 PM RUEDA de CASINO class! We’ll also be celebrating OCTOBER BIRTHDAYS! So message Curuye if you’d like to have your name on the cake!. You’ll want to fuel up with some of Chef Israel’s tasty offerings from his varied menu! If you're coming in a group, message Curuye if you'd like to reserve a table. TELL ONE! TELL ALL! LET's DANCE & CELEBRATE! 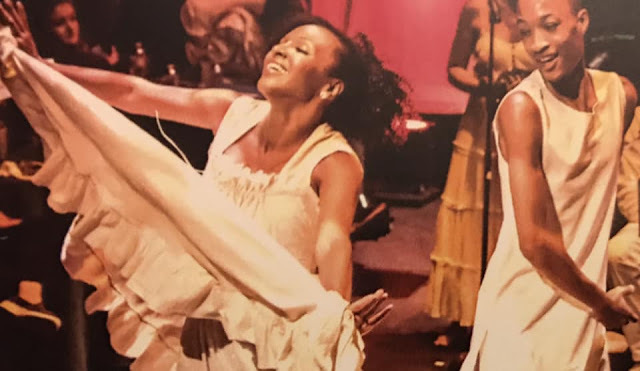 Join Palomar College Dance Department for the 21st Anniversary celebration of the Afro-Cuban/Brazilian Drum and Dance Ensemble, Agogo and the World Drum and Dance Program. Founded and directed by Patriceann Mead. An evening of live Cuban/Brazilian music and dance, features Kimba Light, a fabulous Salsa band. Includes open dance floor. 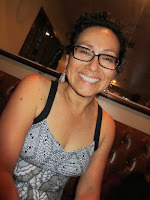 WHAT: An evening of live Cuban/Brazilian music and dance, features Kimba Light, a fabulous Salsa band. Includes open dance floor. 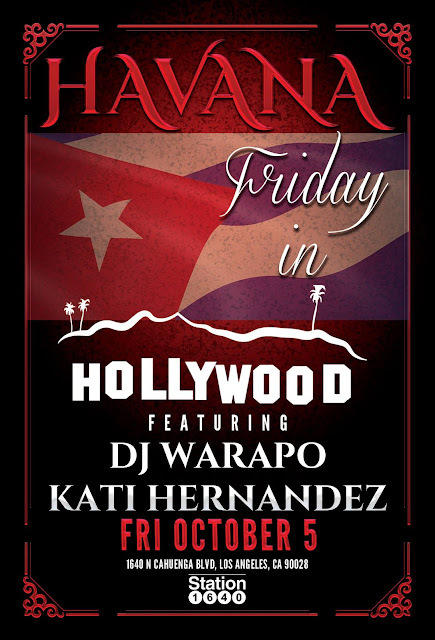 GRAND OPENING of Havana in Hollywood Featuring DJ Warapo & Kati Hernandez! We will have awesome Cuban-style line dances throughout the night and also have great Cuban Music vibes. Don't miss this awesome event! Please send names to DJ Warapo or Kati Hernandez before FRIDAY! Cachito y Su Son brings you a deluxe lineup for this event. Don't miss this out! Lechón Asado ticket includes - General Admission, 1 food dish by Cienfuegos Cuban Cafe & 1 drink. Forbidden Fruit tickets includes: General Admission & 1 complimentary Qban Cigar (Cohiba Esplendidos, Partagas, or Romeo y Julieta) imported directly from the forbidden island. 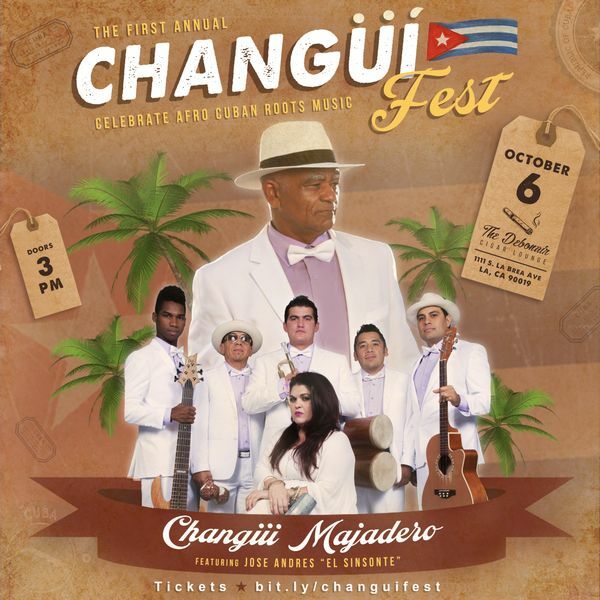 Changüí VIP tickets includes: General Admission, 1 VIP Parking, Access to VIP canopy/shaded area with chairs, 2 drinks, 1 cigar (Debonair cigar, NOT CUBAN) & 1 food dish by Cienfuegos Cuban Cafe. High Rollers Platinum $1,000 includes: 5 General Admission, 1 VIP Parking, Access to your own canopy/shaded area with chairs, 1 complimentary BOX of Qban Cohiba Esplendidos (25 in a box), 1 complimentary bottle of imported Havana Club (cups & ice included), 5 food dishes by Cienfuegos Cuban Cafe, & 5 drink tickets. Please email info@changuimajadero or call (619)730-8180 to purchase the HighRollersPlatinum ticket at $1,000. If you buy the ticket online you will have to pay an extra processing fee of $30. 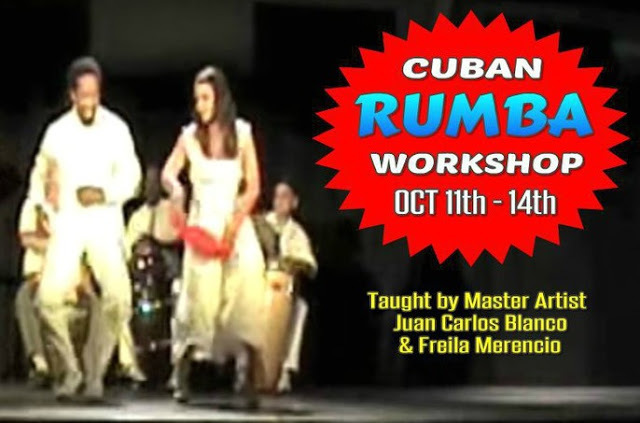 WHAT: Experience a Cuban Rumba Dance Workshop here in San Diego! 'La Rumba' is the epitome of Cuban Dance and the precursor to 'Son', This important rhythm is the basis for a lot of Cuban dance. It is the original fusion of African & Spanish cultural heritage as you will see, feel and hear in this workshop! Learn various genres of Rumba including Guaguanco, Yambu & Columbia with professional Cuban dancers. Learn authentic movement, styling and technique accompanied by Live Cuban Percussion for a truly authentic experience. Workshop classes are appropriate for all levels - from 'never tried it & curious' to 'I love me some Rumba'. No experience needed; only a desire to dance & learn! Que viva la rumba! PARKING: Located in the heart of North Park,STAGE 7 has only street parking available. Therefore, it is highly recommended that you arrive early and give yourself time for parking. Don't have time or feel like searching for parking? There is an Ace Parking Structure 1 block away from the studio, located at 3829 29th Street (Btwn University Ave. & North Park Way). Their daytime rate is $1/1hr with a daily max of $5; Their evening rate is a flat rate of $5. WHAT: Omo Aché celebrates 20 years of performing & preserving Afro-Cuban Music, Dance & Culture! 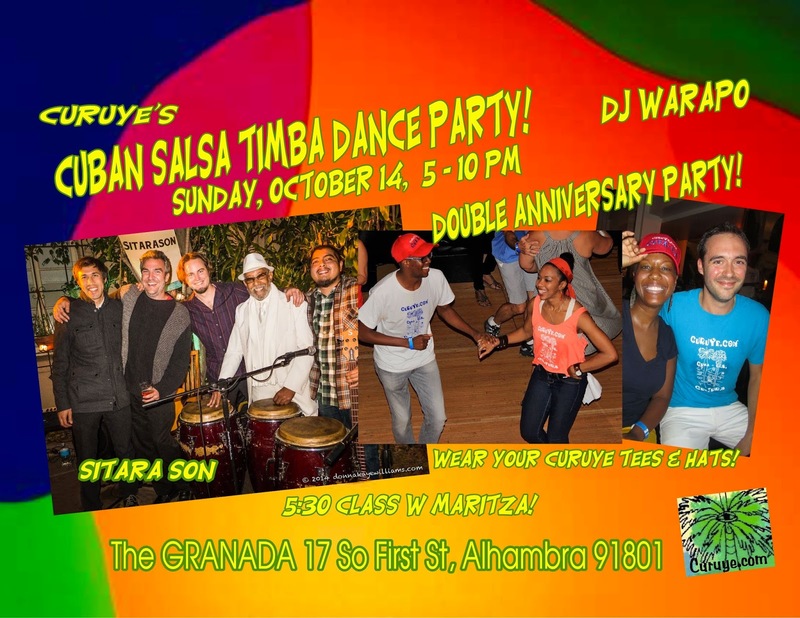 Featuring Live Afro-Cuban Dance Performances & Percussion, Traditional Rumba & Dance Party featuring the best Cuban dance music! COST: Admission: $15 (Cash only) All Ages, Family-friendly Event! "Soy de la nueva generación de músicos cubanos que defiende nuestra cultura y tradición ." ~Mixael Cabrera. YOU DON'T WANT TO MISS THIS AMAZING CONCERT! Be sure to LIKE our Facebook pages as we will be posting latest happenings and information to keep you up to date on the Congress. View our Facebook page. Join us for a night full of Cuban salsa from one of Cuba's best dance bands, Maykel Blanco y Su Salsa Mayor. They will also be promoting their new album "Que Tiene Que Te Mueve"! If you love high energy Latin music, especially from Cuba, then YOU want to attend this upcoming show in San Diego. Tickets are $40 online, or $50 at door day of event. 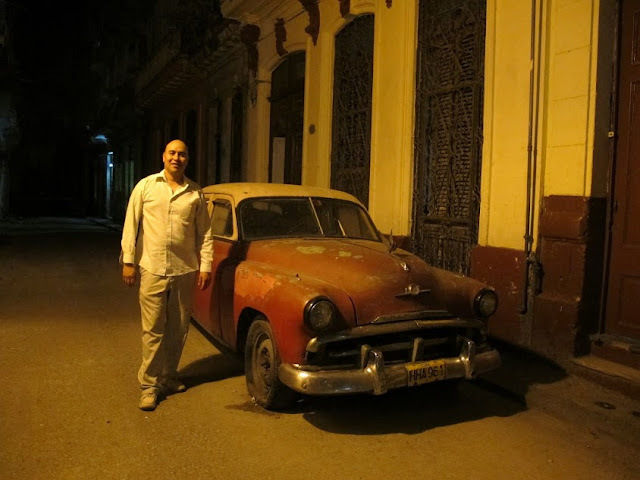 Maykel Blanco is one of the most talented musicians in Cuba today. 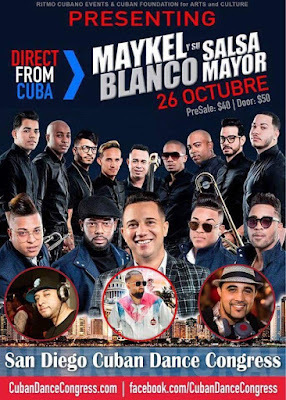 An excellent percussionist and pianist, he is also a talented composer and producer, and he is the director of one of the hottest bands on the Timba scene: Maykel Blanco y Su Salsa Mayor. COST: $40 + $5 process fee online or $50 at the door. You can contact Maritza Baida for tickets - $40 (no processing fee) cash only or Venmo - Please contact her first at (206)300-4523.